In Sharp Teeth (9x12), this might be the shirt that Dean is wearing when he attends the prayer group at Garth’s in-law’s house. He wears it until the evil werewolves are killed. In The Vessel (11x14), Dean wears this shirt until he has to steal and wear a navel uniform in order to blend in on the submarine. Fate: Presumably, this MUST get left behind on the submarine in The Vessel (11x14). Unless Dean stuff it under his stolen navel uniform somehow. 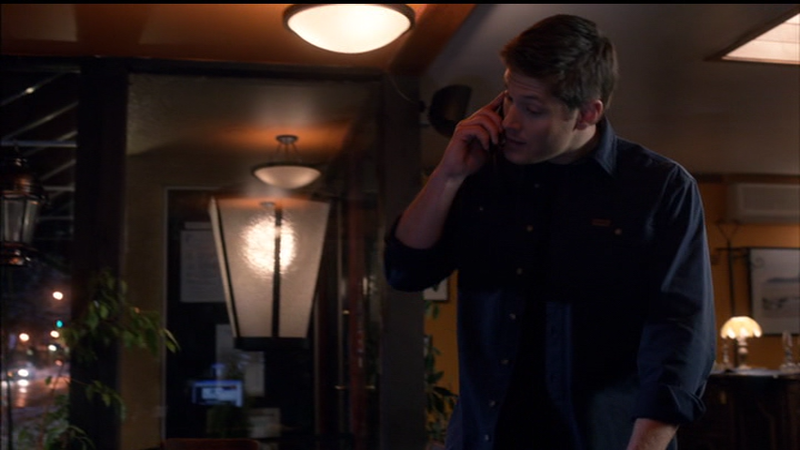 I love Dean's blue shirt. He looks good in blue and should wear it more often. Instead it seems he wears the green shirts more often. Don't like that color as much on him. I think they put green on him a lot because his eyes are green, but I agree that he looks really good in rich blues. (He'd also probably look good in pinks, but that's never going to happen, haha). Don't these people know that you dress people according to their skin coloring and not eye color. Dean/Jensen looks very good in the dark, rich colors like this blue. Red, black, brown and purple are also good colors for him. And yes, sadly, pink is also a good color for him, and while I do admit a pink shirt on a man in a suit can sometimes be very hot, I would rather not see Dean in that color. I'm in total agreement. Mind you, as someone with similar colouring to Dean/Jensen, I know that army green really would bring attention to his eyes...but that being said, it has to be a rich dark army green, not the sort of washed out grey-greens that they keep putting on him. Jensen does wear grey a lot at Conventions, doesn't he. Grey, bordering on black. He always look yummy. So, you can't wear any grey, not even a dark slate grey? Yea, if they insist on him wearing green so much, like you said, I wish they would put him in a darker green, instead of the washed out green that seems to be so prevalent in his wardrobe. If I know the brand, I've listed it - so all you have to do is find out who sells that brand in your area or visit that brand's website, and then have a look. You have to keep in mind that a lot of Dean's shirts were bought several years ago, so that style might not be in production anymore. could you please tell me the name of the brand? Carhartt - it's right there in the title.